Greetings from Florida y'all! So much has happened in the past month that it would take a whole novel to catch everyone up but I'll try. I finished my 24 day challenge with a loss of about 20 pounds. I felt great and was really psyched. Not too long after that I found out that I needed to have a hysterectomy ASAP. Rather than be discouraged or set myself up for a setback I continued with good eating and had my surgery on June 10. I am really convinced that doing the challenge before my surgery helped me with my recovery. Going in with a healthy body (or healthier) felt good. When I got out of the hospital my recovery went better than normal. I was up and walking around within a day and experience little to no pain. I continued to eat as well as I could but it was hard because you must remember I was packing up my house to move to Florida at the same time all of this was happening. I admit, a lot of pizza was eaten. You can't beat $5 pizza from Little Caesars when you're feeding 6 people on a budget. But I did cook as healthy as I could until about two days before the actual move. I was proud of myself for that. My family and I have been in Florida since Saturday. So far unpacking and getting settled has been nice. I was without a stove for a few days because I forgot to get the gas service turned on, and my stove in my apartment runs on gas. But now I'm cooking and made sure to go ahead and stock my cabinets with healthy food. I really feel like my lifestyle as far as eating and exercise will change dramatically down here in Florida. I feel a shift happening and maybe I have craved it for a long time. Maybe that is why the transition and the relocation went so smoothly. Maybe this is just my destiny. Yesterday I wore a 2-pc swimsuit on the beach. First time EVER wearing one in public. But I was confident and felt great in my skin. Maybe it's the knowledge that I am on track and eating well at least 80% of the time. Maybe because in my own mind I know that I have had 1 million excuses as to why I could've fallen off track but I have not. I feel great. And I'm looking forward to an awesome new life! Glad you're OK. And congrats on the move! Your journey is so inspiring! Awesome! It definitely sounds like you are doing well. And you rocked a bikini! Woohoo! 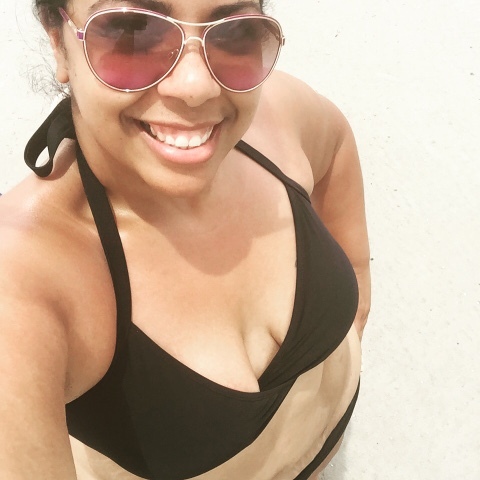 The summer I transitioned into maintenance I bought a two piece swimsuit for the first time. I remember wearing it for the first time quite vividly, because I felt sooo awkward lol. But I powered through it and now I comfortably wear two piece suits with no issues yay! Congrats on the milestone-it's the little things that make this whole thing worth it! thank you for the inspiration :) I am starting the long road of getting healthy, I want to lose the weight that I have recently put on. I'm sure that doing the challenge before helped! I loved the AdvoCare challenge and how great I felt after doing it. It's definitely been one of the things that worked best for me so I'm happy to see your success with it too. I'm also excited that the move went so well for you and is going to be a fresh start. You deserve it and you deserve a fantastic life Hollie! I love reading your post, it looks like you are funny girl. Being positive in life can be seen even you don't speak too much. Being happy is a choice. I will follow all your post. I hope you share more pictures since you are in Florida. Amazing place. Wow I love reading your blog!! how inspirational! I am just starting on the journey to lose about 66 pounds. If you have any tips for me that would be great. You are inspiring keep going! !